Can't figure out the source of an image you found online? There's an easy trick you might not know about -- and it's an essential tool for citing sources. Students who find images they want to use in projects need to follow the appropriate rules of citation: state the title and the original source. But with so much misinformation and mis-attribution online, students might either change the research topic to avoid the problem altogether or simply cite the source poorly. Take, for example, a student wanting to use this image (above) labeled as a cartoon by Rube Goldberg. 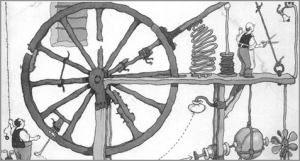 Since he wants to use it in a project, he must find the original source of the image, but when he tries looking through Rube Goldberg’s illustrations of absurd, overly-complex machines, the artistic style looks different. That was a dead end. But there's a Google tool that allows him to use an image as a search term. 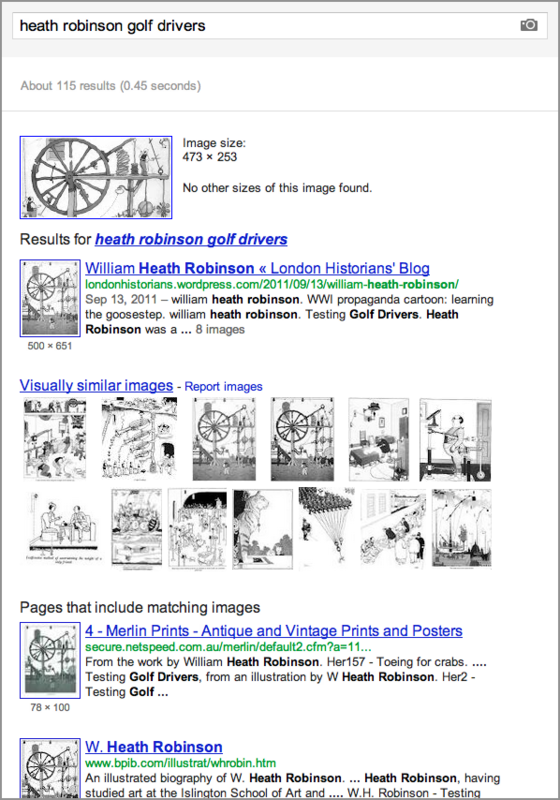 Within just a few seconds, he can discover another artist, named W. Heath Robinson, who also designed humorous machines. With just a few more clicks, he will identify “Testing Golf Drivers,” noted as coming from Robinson’s book, Humors of Golf, in 1923. He can then search to confirm the citation. From a complete mystery to a citable entity in the blink of an eye. 1) Access Google Images by navigating directly to http://images.google.com or by running a search and then clicking on Images in the black stripe across the top of the page or in the left-hand column. 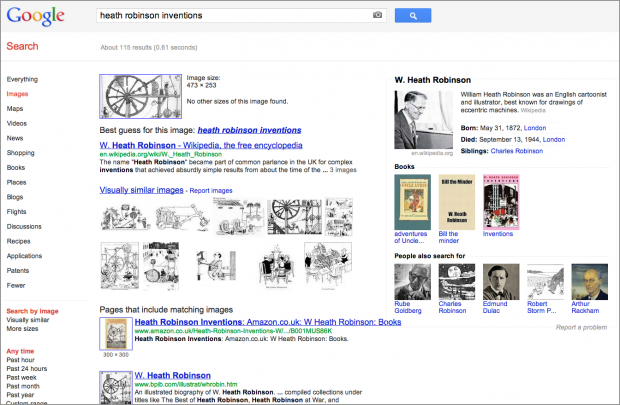 2) Notice that in the Google Images search bar, specifically, there is an icon of a camera on the right-hand end. 3) Simply drag-and-drop the image in question into any search bar with the camera icon. Alternately, click on the camera icon to paste in the web address of an image, or upload an image--which means you can also identify where that vacation photo was taken. 4) Wait for a moment while Google searches its image index. Go find that cool picture that passed through your social network, and figure out where it actually originated!